Boomerang, the Thrift Store at Mt. 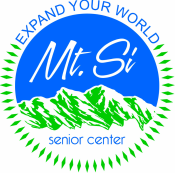 Si Senior Center, is a valuable resource for people right here in the Valley and continues to offer quality items at very reasonable prices. Women’s, Men’s and Children’s Clothes, Shoes, Purses, Jewelry, Housewares, Dishes, Décor, Books, Tools, Craft Supplies, Home Goods….and so much more!!! We do not take large furniture or medical equipment. The first of every month, the Thrift Store holds a 50% off sale on everything! Come on down and see what we have. Donations accepted Monday through Friday, 10 pm until 3 pm. We appreciate each and every donation that comes through our door and take pride knowing that 100% of the proceeds from the Thrift Store go directly to supporting the Senior Center, and what we are not able to use, we donate onward to support other needs right here in our Valley. If you have questions regarding donating items, please call 425-888-3434.